These are all things I felt in my first days at the Franciscan House of Joseph and Mary. However, these feelings only lasted for a few weeks as I was getting acquainted to my new home and looking back I feel silly for even feeling like I wouldn’t fit in. Franciscan House has captured my heart and I don’t believe it will ever let go. Me on the outside of the shelter. Each day around 5pm, I pack my dinner and head to work. As a night shift worker, my days normally begin around 3pm as I prepare for work and my shift begins at 5:30. For the first hour, I prepare my mind, body, and soul – as well as the dorm, for the ladies. I read the log book so I am up to date on what has gone on in my absence, I lay out clean linen and make sure all of the hygiene supplies are fully stocked. Once I am finished with these tasks, I relax until 6:30 when my job fully starts. At 6:30, the role call for the ladies begins. And I do my best to greet them with the warmth that cold Chicago winters are lacking. I give them any hygiene products they need to prepare themselves for a good night’s sleep and I answer any questions they might have. Check in is usually complete by 6:45pm. If any of the ladies are joining us for the first time, I explain a few of the rules and routines of the dorm before they grab dinner. Once they are finished with dinner, I perform a brief intake interview and explain all of the rules of the shelter. Once dinner ends at 7pm, I spend the next hour and a half hanging out with my new family. Some ladies go to bed early, some mingle with their friends, and others use this time just to chill out from a long day. Honestly this is my favorite time with the ladies. When I first met them, they were very hesitant to share anything with me – it took some time to warm up. Now, they share so much and I feel so privileged to be able to share stories with them. I love hearing about their joys and their sorrows; comforting them when the load is heavy and celebrating with them when life brings a surprise joy. Some days 8:30 comes too quickly and others it comes right on time. After all these ladies have been outside all day, they need to rest. From 8:30pm to 5 am the lights in the dorm are off and I sit at the desk to watch over the dorm and make sure everyone has a peaceful night. Depending on the night, this could mean comforting someone who has had a night terror or just sitting alone while the women sleep. Some nights I will talk with 5 women throughout the night, while others I talk to no one. Some nights time flies and on others it crawls. Each night is different. The night shift can be brutal, but it is completely worth it to spend the time I do with the ladies. I get to share a very intimate space with these women; protecting them while they sleep. Once the lights come on in the morning, I help one of the volunteers set up breakfast, I help any ladies who were on 1-night beds gather their linen for laundry, and I do any other things that might need to be done so that the ladies are fully prepared for the day ahead of them. Breakfast begins at 5:15 am and then the ladies have until 6:30 am to gather their things and head out. Just as the nights vary, so do the mornings. Some days I feel like I am working with mute zombies; others the energizer bunny. Mornings can be filled with tears, frustration, laughter, or silence. But this is true of all of us. Sometimes we wake up on the right side of the bed, but any given day it was the wrong. What truly amazes me about these women is that the majority of days they wake up with smiles. They do not let their circumstances turn them into monsters. Of course they have bad days, but we all do. For the most part these women continue to inspire me everyday. I am so grateful for them and the many things that they have taught me throughout this year. I am not the same person I was when I got here; they have all changed me in so many ways. Tina has taught me incredible kindness and to let go of judgment. She sees people with the eyes of love; her world must be so beautiful. Jessica has taught me the importance of silent support and strength in great struggle. She was very sick in the time that she stayed at the shelter, however she never showed anyone that side of her. She never let her illness turn her into an ugly person. She kept persevering and caring for others before herself. Alex is a fighter – so independent and strong. She took responsibility for herself and decided that she would do whatever it took to rebuild her life after so many things had fought to destroy it. Maria teaches me about hope and optimism. Janelle teaches me about loyalty and strength. 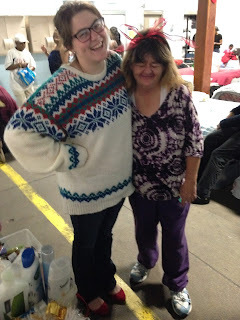 Heather teaches me about true love for others and the lack of importance in material things. Casey helps me to grow in patience and teaches me about the importance of support and love. Dana continually shows me the face of God and the love of Christ. Katherine constantly reminds me of the importance of sharing our burdens, so they don’t become crippling. Layne shares such great joy! Polly has a great sense of humor. Liana protects me. Joy and Kathy support me. And finally, Ms. Victoria! She is the definition of a dream come true! She makes the dorm so bright and lively. She dances, she sings, she laughs, and she loves. But what she really taught me was that we all carry something that makes life harder, but it cannot be an excuse to neglect others. She is carrying an incredible mental illness that made it very difficult for her to relate to others, however not once did I ever see her ignore the needs of others. She really took care of all the ladies through small acts of kindness. These ladies have the most beautiful way of simultaneously supporting and challenging me. I thought I was hired to take care of them, but what I have come to realize is that they are the ones caring for me. I could not ask for a better place to work.